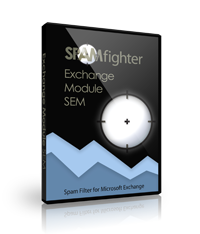 SPAMfighter Exchange Module, SPAMfighter Mail Gateway and SPAMfighter Hosted Mail Gateway are the most effective and easy-to-use Spam Filters for protecting the company network against spam and phishing fraud. SPAMfighter Mail Gateway is powered by 8,958,518 SPAMfighters from 238 countries/areas. If enough SPAMfighters report the same spam e-mail, it is instantly removed from all SPAMfighters and users. This means instant spam protection with no configuration or maintenance. SPAMfighter Hosted Mail Gateway is the simple and low-cost solution for companies, organizations and individuals who have their own domain name and want to get rid of spam without buying and maintaining their own anti spam server.